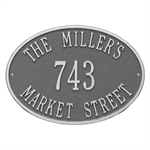 Our Wedding Collection Personalized Address Plaques are handcrafted in Michigan (by Whitehall Products) and perfect for wedding gifts. 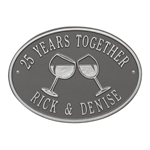 This collection of Wedding Plaques make for a perfect gift for the newlyweds or excellent anniversary gifts for those couples who have been married a while. 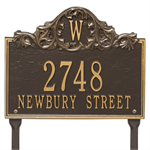 Whitehall has been handcrafting personalized name and personalized address plaques for nearly 70 years. 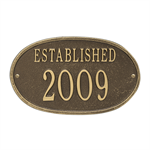 Established Date Personalized Plaque. 12.5'' x 7.5'' with one line of text. Holds up to four 3'' numbers. Makes for great wedding or anniversary gifts. 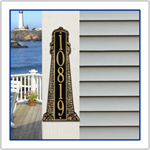 Standard Size Address Plaques are perfectly suited for average size homes. 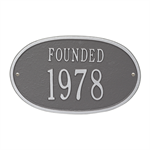 Founded Date Personalized Plaque. 12.5'' x 7.5'' with one line of text. Holds up to four 3'' numbers. Makes for great wedding or anniversary gifts. 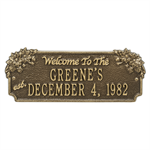 This personalized plaque is a unique and memorable way to commemorate an important date. 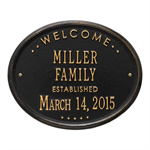 Welcome Oval "FAMILY" Established Personalized Plaque. 14'' x 11.43''. Plaque customized with Line 1: Family Name 14 characters 1.25'' and Line 2: Established Year 13 characters 1.25''. Makes the perfect wedding, anniversary or housewarming gift. Welcome Oval "HOUSE" Established Personalized Plaque. 14'' x 11.43''. Plaque customized with Line 1: Family Name 14 characters 1.25'' and Line 2: Established Year 13 characters 1.25''. Makes the perfect wedding, anniversary or housewarming gift. Wine Glass Oval Personalized Plaque. Size is 14.25'' x 10.25'' with two lines of text. Line 1 holds seventeen 1.25" characters and Line 2: seventeen 1.25" characters. Two lines of customization offers endless possibilities! Makes for a perfect gift! 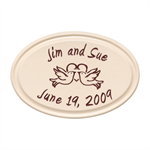 Anniversary Heart and Birds Ceramic Personalized Plaque measures 10.9'' x 7.4'' and is engraved with 2 lines of sixteen 0.75'' characters. The kissing birds and heart are a permanent part of the design. Makes for great personalized wedding gift. 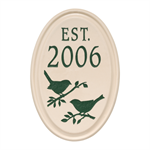 Bird Established Ceramic Personalized Plaque measures 10.9'' x 7.4'' and is engraved with 1 line of four 1.5'' characters. 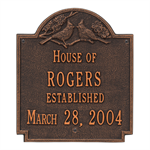 This personalized bird established plaque is a unique and memorable way to display an important date. Makes a great wedding gift. Anniversary Heart and Birds Ceramic Personalized Lawn Plaque measures 10.9'' x 7.4'' and is engraved with 2 lines of sixteen 0.75'' characters. Sign stand included. Makes for great personalized wedding gift. Handcrafted in the USA from Tennessee clay. 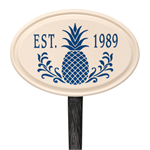 Pineapple Established Ceramic Personalized Lawn Plaque measures 10.9'' x 7.4'' and is engraved with 1 line of four 1'' characters. Handcrafted in the USA from premium Tennessee clay, then protected with a lead free glaze. Makes a great wedding gift. Acanthus Monogram Personalized - Wall Plaque. 14'' x 11.25'' with two lines of text. Line 1 holds up to five 3'' characters. Line 2 holds up to fourteen 1.25'' characters. 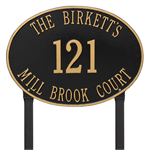 Standard Size Address Plaques are perfectly suited for average size home. 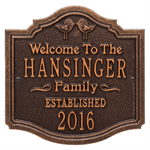 Antebellum Welcome Personalized Plaque personalized with 3 lines, Line 1 holds four 1.75'' characters, Line 2 holds ten 1.25'' characters, and Line 3 holds ten 1.25'' characters. Plaque measures 12.5'' x 9''. Makes a great personalized wedding gift. Bless This Home Monogram Oval Personalized Plaque Plaque is 14.43'' x 10.35'' includes a monogram and eighteen 1.25'' characters. The poem "bless this home and all who enter" is a permanent part of the design. Cast aluminum plaque Made in USA. Cardinal Wedding Personalized Plaque. Size is 10.75'' x 12.25'' with two lines of text. Line 1 holds twelve 1.25" characters and Line 2: twelve 1.25" characters. As cardinals are known to mate for life, they are the perfect way to commemorate the date. Daisy Welcome Anniversary Personalized Plaque. The words "welcome to the" and "est." are a permanent part. 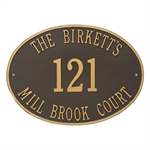 Reminiscent of the bridal bouquet from the day you were married this decorative address plaque contains beautifully detailed floral corners. Emerson Monogram Plaque. 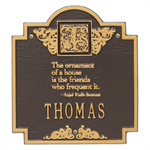 A Personalized plaque is a perfect gift to commemorate all of life's celebrations. Features Ralph Waldo Emerson quote. ''The ornament of a house is the friends who frequent it''. Includes monogrammed letter. Emerson Quote Personalized Plaque. Invite friends into your home with a classic Ralph Waldo Emerson quote wall plaque. 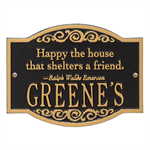 This elegant plaque reads, "Happy the house that shelters a friend" - Ralph Waldo Emerson. Plaque is 10.25'' x 7.75''. 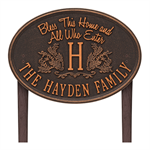 Estate Hawthorne Oval Personalized - Wall Plaque personalized with 3 lines, Line 1 holds seventeen 1.5'' characters, Line 2 holds five 3'' characters, and Line 3 holds seventeen 1.5'' characters. Plaque measures 19'' x 14''. Made in the USA! Family Tree Personalized Plaque. 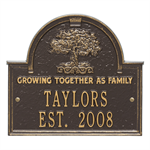 This architecturally inspired plaque with a decorative family tree and the quote "Growing Together as Family" is a great way to commemorate your family. Space available for Family name and established date. Hawthorne Oval Personalized Plaque personalized with 3 lines, Line 1 holds fourteen 1.5'' characters, Line 2 holds five 3'' characters, and Line 3 holds fourteen 1.5'' characters. Plaque measures 14.25'' x 10.25''. A Personalized plaque is a perfect gift. 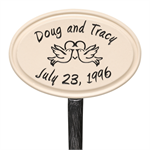 Kissing Birds Personalized Plaque makes a great personalized wedding, anniversary, or house warming gift. Personalized with 2 lines, Line 1 holds eleven 1.5'' characters, Line 2 holds four 1.5'' characters. 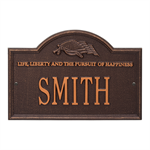 Life and Liberty Personalized Plaque. Makes a great personalized wedding, anniversary, or house warming gift. The quote "life, liberty and the pursuit of happiness" is a permanent part of the design. One line with five 3'' characters. Penn Dutch Wedding Personalized Plaque. 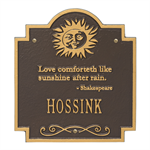 Plaque is 11.125'' x 12.625'' includes a graceful shape and heart-tulip ornament. The words "house of" and "established" are a permanent part of the design. Makes for a nice wedding or anniversary gift. Sun Poem Personalized Plaque. 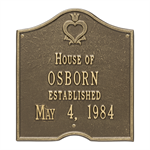 A Personalized plaque is a perfect gift to commemorate all of life's celebrations. Features Shakespeare quote. ''Love comforteth like sunshine after rain.''. Includes one line of text. Holds up to twelve 1.25'' characters. Acanthus Monogram Personalized - Wall Plaque. 14'' x 11.25'' with two lines of text. Monogram letter, Line 1 holds up to five 3'' characters. Line 2 holds up to fourteen 1.25'' characters. 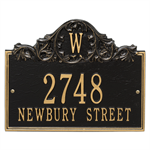 The majestic Acanthus address plaque showcases your address. Bless This Home Monogram Oval Personalized - Lawn Plaque is 14.43'' x 10.35'' includes a monogram and eighteen 1.25'' characters. Stand included. 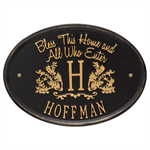 Add a unique finish to your home while you welcome your guests with this Bless Our Home personalized plaque! Estate Hawthorne Oval Personalized - Lawn Plaque personalized with 3 lines, Line 1 holds seventeen 1.5'' characters, Line 2 holds five 3'' characters, and Line 3 holds seventeen 1.5'' characters. Sign stand included. Plaque measures 19'' x 14''. 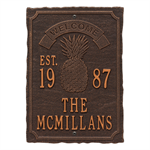 Personalized Monogram Coir Door Mat. Holds One 8'' x 8'' Monogram Tile. 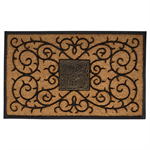 This personalized door mat is a unique and memorable way to display your family monogram. Makes a great personalized wedding, anniversary, or house warming gift.